Why marginal benefit equals marginal cost in economics… always! - FreeEconHelp.com, Learning Economics... Solved! Home economics marginal benefits marginal costs Why marginal benefit equals marginal cost in economics… always! Why marginal benefit equals marginal cost in economics… always! In economics, the solution to your problem or the equilibrium point in the economy is always going to occur where marginal benefit equals marginal cost. Granted, the names for marginal benefit may change (such as “price” for perfectly competitive firms, or “marginal revenue” for the monopoly and monopolistic firms). 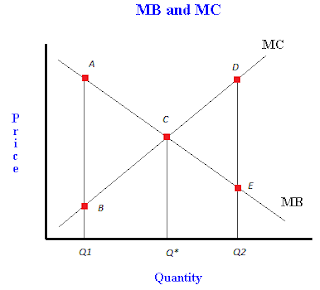 You may also get corner solutions as you progress in your economic career, but for introductory level classes it is very important to remember that at the optimum, marginal benefit equals marginal cost (MB=MC). So why is it that MB is always equal to MC? Remember that economists like to conduct their analysis on the margin, so past choices that are made don’t influence their current decision making process (remember the idea of a sunk cost?). So when looking at the costs and benefits on the margin, we get our marginal costs and marginal benefits. The reason we want marginal benefit to be equal to marginal cost is because of the observed fact that marginal costs and benefits don’t stay constant as more of a good is produced or consumed. This idea of declining marginal benefits, and increasing marginal costs can be reviewed by looking at previous posts describing the law of demand (for marginal benefits) and the law of supply (for marginal costs). What we conclude in the end is that we draw the following graph representing the relationships. Begin by looking at the X axis labeled quantity. When quantity is relatively low (at Q1) we see that we have a high marginal benefit (point A), and a low MC (point B). This means that our marginal benefit is higher than our marginal cost, or that when we move to Q1 we are receiving more of a benefit than we are losing in cost. When we move to quantity Q*, we see that marginal benefit is now equal to marginal cost. Every point to the left has MB>MC, and every point to the left MB<MC. Finally when we move to Q2, we see that MC (point D) is greater than MB (point E), which means that we are giving up more in cost, than we are receiving in benefit… not a good thing. Another way to think about it starts by considering the point at Q* where MC=MB. If we are to the left of this point, then MB>MC and we can experience a net gain by moving right (because MB>MC so some a surplus is possible). If we are to the right of Q* then MC>MB, and we can experience a net gain by moving left (since MC>MB we benefit by lowering quantity). Because of these two relationships, it makes sense to be at Q* where MC=MB, because if we are anywhere else, we are leaving surplus on the table. 1) Imagine you are buying pizza by the slice at a local shop. You are starving when you enter the shop and decide to purchase that first slice. The first slice tastes great and really fills you up (high marginal benefit), and since it is your first purchase you are barely dipping into your wallet (low marginal/opportunity cost). So here, MB>MC. Since you are still hungry you purchase more and more slices, and each slice doesn’t fill you up as much as the last and you are already feeling stuffed (declining marginal benefit). At some point, you have ordered so much pizza that you feel like you are going to vomit (very low marginal benefit) and you spent your rent money in order to acquire it. At this point MC>MB and you’ve gone too far. 2) Imagine you are in charge of a shop selling pizza. The first customer who comes in is willing to pay a lot (high marginal benefit) and your shop can easily accommodate their request because employees are ready, and ovens are idle (low marginal cost). As more and more customers come in, maybe they bring coupons or walk out if they have to pay higher prices (declining marginal benefit). You also realize that you need to hire more workers to keep up with their requests (higher marginal cost). At some point, you feel like you are running a soup kitchen because no one is paying much (very low marginal benefit) and in order to get enough employees to cook, you have to pay very high wages (very high marginal cost). At this point MC>MB and you’ve gone too far. The following corrections needs to be made. Every point to the left has MB>MC, and every point to the RIGHT has MB<MC.